Episode 48 of Eureka Seven is arguably an episode-long opening to a final battle, the final clash between Nirvash and theEND, Holland and Talho and Jurgens’ last charge against Dewey’s fleet. All the ingredients, and all the visual language, of a truly epic battle are set forward. An immense enemy armada protecting a superweapon, heroic ace pilots going on against impossible odds, and the final showdown between the two experimental units – the two mecha that have fought each other to a standstill every time they have clashed. Yet as it progresses it is very clearly not an action climax in any traditional sense. The episode is the culmination of Anemone’s plot, of Dominic’s journey of moral awakening, and an intensely personal thing within an epic framework. 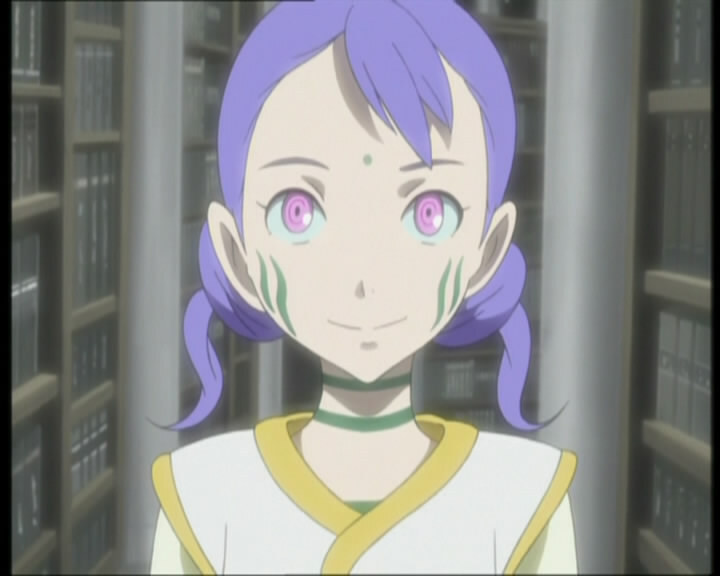 One question that has not been frequently raised in all of Eureka Seven‘s discussion of religion and godlike planetary intelligences is the matter of an afterlife; it is by now proven as fact that a planetary intelligence exists, and that its intention towards humanity is, in a way, peaceful. It has reached out with a messianic figure twice now and found a proper counterpart for Eureka in Renton. It is faced with humans led by Dewey who believe themselves superior to the divine, who would seek to enforce mastery over it. At the end of episode 47, Dewey claims that mankind will not bow down to, or live in fear of, an “unknown creature.” If God is supposed to be inscrutable, incomprehensible and omnipotent, then the line between faith and fear is – from this perspective – blurred. 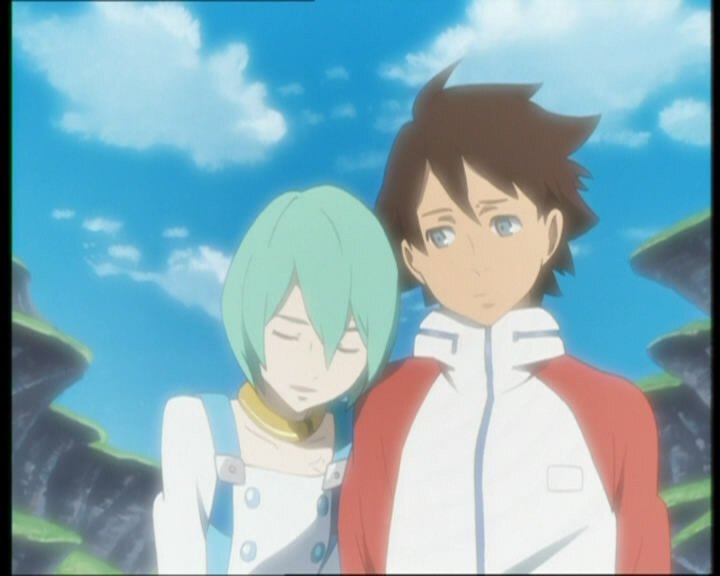 The overwhelming theme of episode 46 of Eureka Seven is family and the ability of familial ties to overcome grief and disagreement. It is not limited to traditional familial units, picking up on the series’ emphasis on nontraditional families and family-like entities and exploring how within close-knit social and professional groups like military units a certain kind of familial piety can exist. It would be easy to say that it is examining friendship more than family, but the constant theme throughout the series has been how, for people who lack biological parents, these social groups become a new family. What matters more than blood ties is that there are dependable – even if they are flawed – people to offer advice and support if needed. 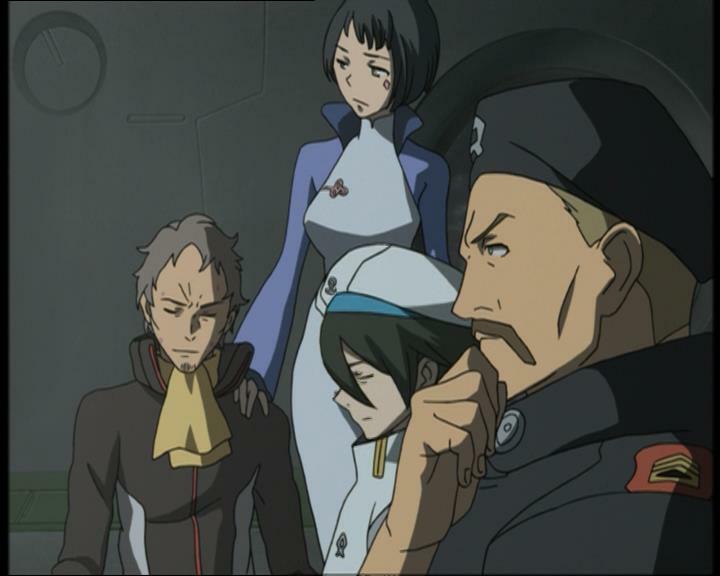 For several episodes the secondary plot of Eureka Seven, the increasing disharmony among the Federation forces around Dewey’s increasingly extreme plans, has proved more interesting than the main plot of Renton and Eureka as the emissaries to an apparently uncaring alien intelligence. This is perhaps indicative of the series’ wider difficulties; it is a particularly existential story at its heart, an expansive narrative that plays its hand very cautiously. Renton and Eureka’s non-courtship, their development, has played out over the whole series so far and now they are left in limbo, the preparations by definition inadequate. A human story – the mad genius trying to destroy the world to prove a point – is understandable. It offers a conflict that can be comprehended and fought with guns, the sort of thing a mecha anime wants. A story of metaphysical self-discovery, of discussion of the nature of humanity and of the nature of an alien deity, is alien, conceptual science-fiction. That Eureka Seven discusses this, and gives it space to grow and develop at the pace of uneasy first love as an allegory for first contact is its virtue, and yet at the same time difficult to write about on an episode-by-episode basis. Note: This article discusses a quite emotive and moving section of Eureka Seven whose impact mostly comes from the revelations within. It may be best not to read it unless you have already seen the series and know what happens. 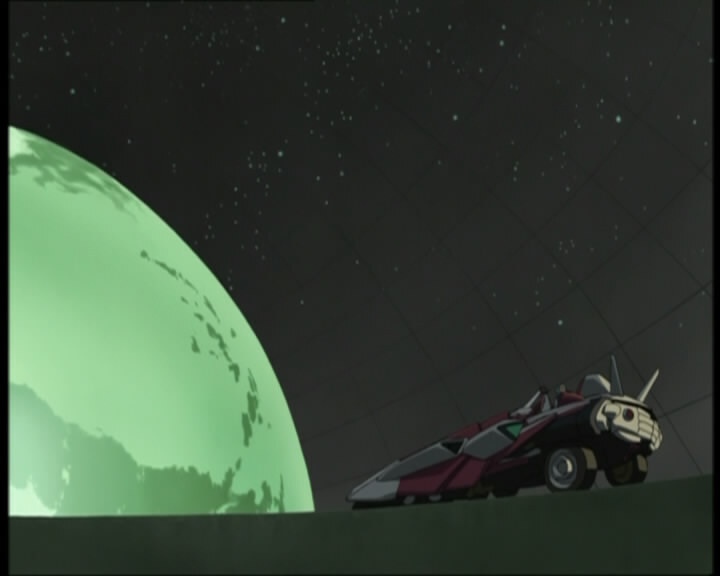 Much happens in episode 44 of Eureka Seven to advance the main plot; Renton and Eureka continue to explore the new world they find themselves in as morale begins to drop, Holland learns that he will die should he continue fighting Dewey not because of the enemy, but because his machine is so outdated the drugs he need to pilot it will destroy him, and the scene ends up set for a confrontation between Dominic and Jurgens for the Federation and Holland for the Gekkostate. 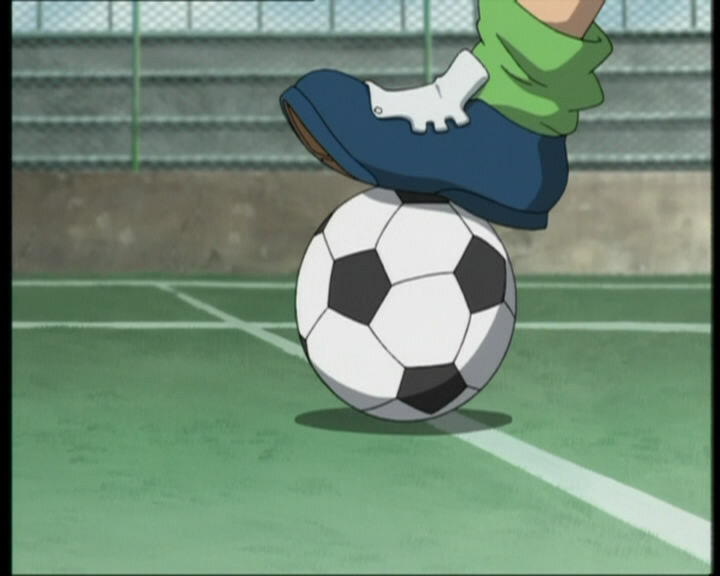 That the climax of the episode is Eureka beginning a similar metamorphosis to Sakuya – suggesting that Renton will fail as Norb did, unable to properly reach out to the Scub Coral and save the world – is setting up a massive, metaphysical conflict that cannot be easily resolved. Yet more interesting, and the more enduring image of the episode, is how it continues Dominic’s plot. Dominic was established in episode 43 as being, put as simply as possible, the Kamille to Anemone’s Four – a comparison subverted by Anemone’s agency and self-determination, her desire to not simply be “saved” like a damsel in distress but for someone to actually care for her. Episode 44 has him initially uncertain about how to do this, an outsider – and ends with him a man with conviction. Episode 43 of Eureka Seven significantly advances the main, alien-contact plot in its scenes of Renton and Eureka on an unusual beach. They have travelled to the Promised Land, as expected, and face new challenges even with Norb’s clues about its identity. The viewer learns, in time, about Earth’s role in this setting (and the difference in perspective from which the characters view it) – yet what is more interesting by far, beyond the actual main plot, is the subtle building up to a subplot for Dominic and Anemone and how the revelations this offers about Dewey and Holland reflect on what Renton and Eureka are seeing. It is one of the points in Eureka Seven, much like the Ray and Charles subplot, where it deftly redefines and arguably surpasses its roots in Gundam. Eureka Seven is indebted to the Gundam franchise, yet – much like the similarly referential and reverential Rahxephon has its uneasy relationship with Evangelion – it is at its most fascinating when it diverges from it. Were Eureka Seven’s 42nd episode to be the beginning of its immediate end, the setup to a resolution of the whole plot in episode 43, it would be a fitting and powerful ending. As the introduction to a longer final arc it is just as powerful, and definitely the point where for all its superficial resemblances, the series moves far away from Gundam via a damning exploration of the same themes. It is – in a series built on build-and-release moments of emotional intensity – a long-deferred moment of emotional power for every character, not simply a barometer of Renton’s maturity or Holland’s coming to terms with his past, but absolute closure for plot threads which have been running for 41 prior episodes. Emotional release – the climaxes of past arcs, the moments of revelation and resolution that have preceded this point, implies a build back up, a temporary moment of clarity from which lessons are learned and the next conflict will build on. The whole focus of episode 42 is on moving on in the most physical sense, driving forward and looking to definitively close the past off. 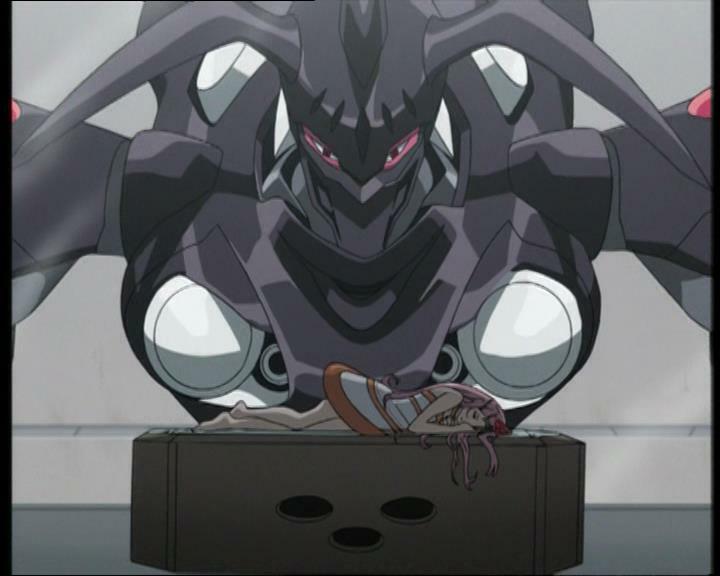 Episode 41 of Eureka Seven is the point where revelations about the true nature of Sakuya – the being at the Great Wall who the Gekkostate have been moving towards, and will fight to the end to protect, are laid out. Who she is – and why she is important – is told via a narrative that stands as a parallel to Renton and Eureka’s own story, turning the events of Eureka Seven‘s opening arc into a kind of replaying of an in-setting myth. Sakuya, being a Coralian much like Eureka, exists as a parallel Christlike figure (for as I have mentioned previously it is hard not consider the Corals’ ambassadors as children of the divine sent to observe – and even judge – the mortal world) but one who, as Norb suggests, failed to cross the Great Wall and could not complete whatever cycle needs completing. With the final preparations complete – in the form of an episode of down-time – Eureka Seven is finally ready to begin its ultimate confrontations. Renton is going beyond the Great Wall to find out some kind of truth, Stoner and Holland are preparing their expose of the Coralians and Eureka, and Dewey is planning his own operations to bring an end to the Coralian “threat.” The shift in focus is established with a new opening theme tune, probably the best of the series’ four themes. 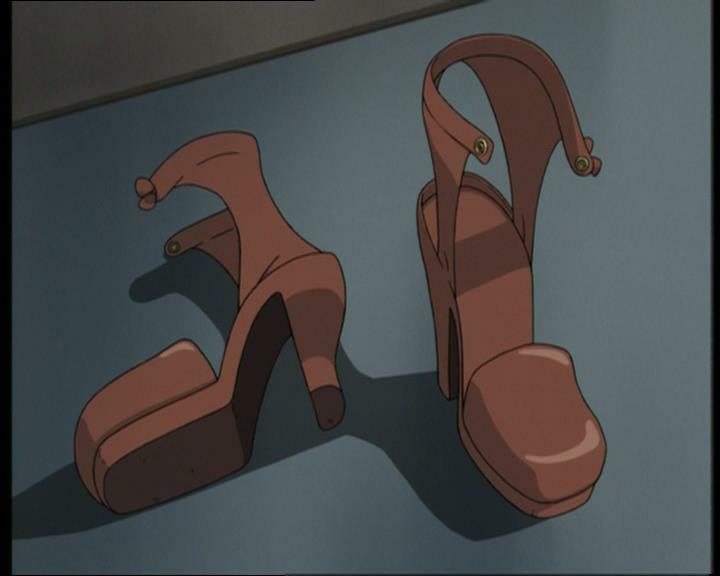 The theme tunes and credits sequences have throughout the series tonally reflected what is happening – the third, the punk-esque To the Centre of the Sun, played through the series’ impetuousness and kicking out – and now Sakura, the fourth theme, comes with its very heroic and spiritual sound for the show’s climax – established as something that must be religious. This article also includes discussion of the plot of the serial Nearer My God To Thee (Abnett, Harrison, Parkhouse), printed in 2000AD issues 1883-8.